Not sure the best ammo to feed your AR for the range and home defense? We’ll go over caliber, barrel twist, bullet type, and price range to find your perfect fit. 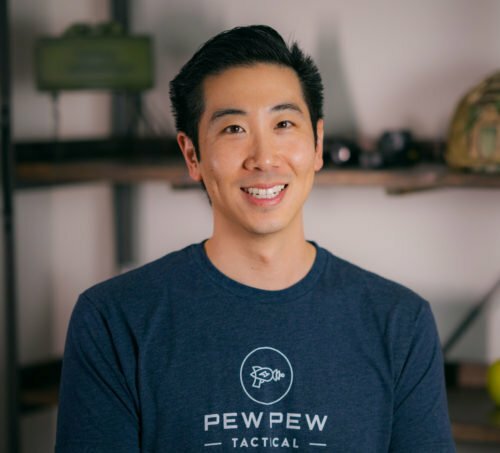 *UPDATED 2019*: New .223, self-defense options, and more online stores. Ready to see why we chose these and the best places to find them for cheap? Your average AR-15 comes in two popular calibers, the 5.56x45mm NATO and the .223 Remington. You can double-check what it is by looking at your model specs or physically on your barrel, which should be stamped with the caliber and barrel twist rate. 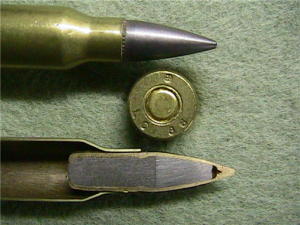 The two cartridges are physically identical but the 5.56 may be loaded to higher pressures than .223 ammunition. The .223 is a civilian round and has SAAMI specs (an organization that sets standards for pressure and dimensions) while the 5.56 is a military round that has their own specifications that might require higher pressure for higher velocity. Please note that .223 Rem and .223 Wylde are not the same things. One (Wylde) is perfectly safe to fire either 5.56 or .223, however, a .223 Rem chamber is not safe to fire 5.56 NATO. Your barrel or rifle probably won’t instantly blow up from shooting a 5.56 in a .223, but why risk it? Combine that with the variance in the machining of the barrel and ammo production standards, it’s best to use the proper ammunition. Your barrel stamp should indicate the barrel twist after the caliber. You should see a ratio of 1:7 all the way up to 1:12 and it means that the barrel will spin the bullet one revolution every X inches. Most barrels will be from 1:7 to 1:9 twist, with the most popular being 1:9. Take a look at the chart below to see the ideal twist rate for your barrel. 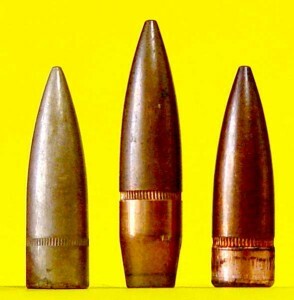 The heavier grain bullets are usually reserved for the military and their tracer rounds. 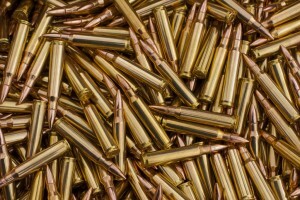 With normal cartridges, you’re most likely to see 55 grain and 62 grain bullets. These are fine to shoot in 1:7 to 1:9 barrels and you probably won’t even notice a difference up to 300 yards. You’ll see two big families of bullet types, the full metal jackets (FMJ) and the hollowpoint/softpoints (HP/SP). The FMJ’s are great for plinking while HP/SP are more for home defense or long-range applications. FMJ is also sometimes called Ball ammo. 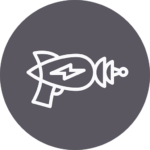 Other confusing acronyms you might see include (BT) which means boat-tail and indicate the back of the bullet has a more aerodynamic shape than simply cutting off straight. The middle one below is an FMJ-BT. Lastly, if you’re looking at military 5.56 rounds, you’ll see M193 and M855. 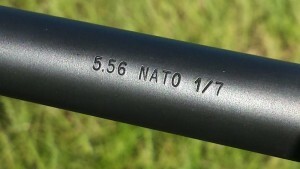 The 55 grain M193 is the standard FMJ of the military while the 62 grain M855 is the “green tip” penetrator round that has a steel rod inside (light gray). Most of the time you’ll see XM instead of just M…that means it didn’t quite meet military specifications but still meets commercial specs. Learn more here. We’ve selected a couple of our favorite online places to buy ammo. We’ve been buying from them ever since we got started and they have great live inventory, appropriate shipping charges, and quick service. And since prices and inventory fluctuates, we recommend looking at all the vendors to see the price differences. Sometimes one will be running free shipping deals! Now we combine the good stuff we learned above and stick to 55/62 grain bullets that are close to military specifications. These are the rounds that we’ve shot tons of and never had a problem. Our suggestions are also all brass cased so you can keep them if you think you might ever start to reload your own ammo in the future. Our Editor’s Pick is currently American Eagle XM193 since it’s never failed to go *boom* and the price is almost always one of the lowest. Our second choice is PMC which also has never failed but is often a cent or two more than American Eagle. Our favorite green tip ammo suggestion is going to sound about the same…what can I say, it works and the price is right. And PMC’s X-TAC XM855 variant is also GTG. If your barrel is .223 or if you want to shoot some slightly lighter loads in your 5.56 barrel. My personal favorite is PMC Bronze since it’s affordable and the brass is great for reloading. Plus…it’s on the low end of recoil so I love it for competition. If you aren’t looking to reload and want the best bang for the buck…all my buddies and I love Wolf Gold. Buy it cheap (1000 round boxes) and stack it deep! Wolf Gold is made in Taiwan and not Russia like other Wolf ammo. We don’t readily use these next suggestions in our AR’s, but if you’re really trying to save money, you can opt for Russian steel or coated steel cartridges. Start off with a small batch first since some AR-15’s don’t like steel cased ammo. They offer pretty good savings but are dirtier shooting and less accurate…but probably great for the range. Also keep in mind that you can’t save these to reload later, and you need to shoot at a range that allows both steel casings and bi-metal bullets. For self-defense you want the bullet to put all its energy into the bad guy by breaking apart. That means FMJ and the penetrator rounds are usually not the best choice. I recommend going with specific use self-defense ammo that is hollow/soft point and is used by law enforcement. Both Speer and Hornady are great but I give the edge to Hornady since I love their pistol defensive ammo. Another go-to brand for self-defense rounds…Gold Dot. So there you have it, our recommendations for the best AR-15 ammo in both .223 and 5.56. Let us know what you went with and how it runs in your AR. Want more AR-15 guides…check the all out here. Surprised you didn’t mention Hornady in your list of best ar rounds in .223. With their excellent engineering, variety of various offerings, and supreme craftsmanship in their ammo one can’t go wrong in using it from game to targets. They are the top of the list in my experience. Article is due for an update soon and we were planning on adding Hornady, their .223 ammo is very nice and is what is currently loaded in my HD AR. Have you tried Frontier(Hornady/ Lake City) 223 / 556 offerings? I find the 55gr PMC bronze shoots well but runs quite dirty/smokey. When it first released we heard nothing but horrible things about it, however it seems they have fixed the issues. I haven’t personally run any yet, but based off of feedback it should be good to go. … I give the edge to hornady since I live their pistol defensive ammo. That’s merely opinion, if you are making recommendations at least use factual evidence to present an arguement. In a self defense situation price is irrelevant too, buy the best most reliable and effective ammo so you don’t have to worry. Hornady doesn’t even make the best pistol ammo. Anyway, the other issue is so much ammo left out. I’d say the biggest one being neglected is MagTech for price, target ammo, “always goes bang” and groups really well. accurate 5.56 is Hornadys Frontier 55g HP. Inexpensive too. Shoots (for me) 1 moa and better.